Our oldest daughter, Heather, is off to Tegucigalpa, Honduras as a Spanish interpreter for the Global Medical Brigades through a UC Santa Cruz club in June to set up a health clinic. We are excited for her since she has such a passion to help people. We are having a drawing for a $300. gift certificate of Nicholson Blown Glass to help her on her way. One ticket $5. or 5 for $20. Let me know if you would like to join in! 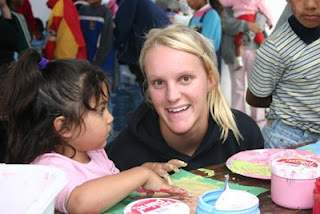 The photo is of Heather volunteering in Ensenada, Mexico - She has also volunteered in Salta, Argentina. We are very proud of her efforts! This is a beautiful chandelier that we created for the entrance to a custom home overlooking the American River Canyon. It needs to find a new home and we are helping to get the word out. The metal work is all hand forged in our studio with a Japanese brown patina and copper patina leaf details. The freehand blown glass is a deep green in our Earthbound Series with silver and chips of color on the surface. 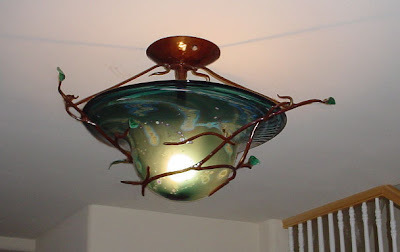 The glass is 23"W x 7"D and the metal is 29"Wx14"D - use three standard light bulbs. The cost is $2,200 with either shipping or installation included. We always make at least 2 or 3 pendants to get 1 for a custom order ~ perfectionists that we are ~ so we'll be featuring extra pendants at a special price along with our custom lighting and sinks. Our friend of 30 plus years, "the artichoke man", will be there too so we'll be feasting on fresh artichokes! 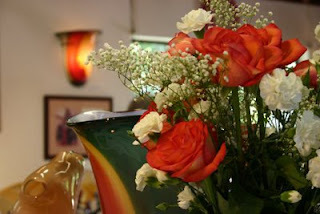 Fawnridge "Art for Your Cellar"
Fawnridge and Nicholson Blown Glass are open for Mother’s Day Weekend! 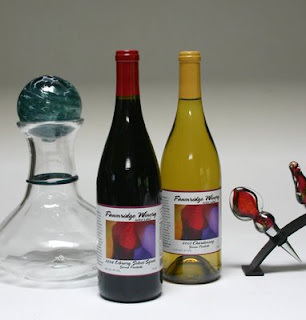 Fawnridge Winery proudly presents the first Artist Series Label featuring the art of Nicholson Blown Glass. Two wines are offered: The silver medal winning 2007 Chardonnay and the Library Select 2002 Syrah. These wines may be purchased exclusively at Fawnridge Winery. This is a very limited bottling and will certainly sell out quickly! www.fawnridgewine.com We have handblown decanters and stoppers to compliment the wonderful wines. 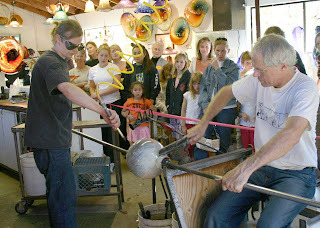 Stop by Fawnridge and our studio Mother’s Day weekend to taste wine and watch the glassblowing! May 9 and 10 ~ 10 to 5. 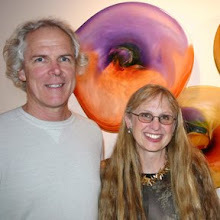 This weekend is the North Auburn Art Studios Tour - 12 artists, 8 studios - May 9 & 10, 10 to 5. www.northauburnartists.com for directions to studios. We are always open Mother's Day weekend! I remember trying to get my little girls to fix breakfast in bed before the tour - but since I was always the first up getting ready - I gave up on that one! They are now 19 and 21! We'll be demonstrating and the neighboring wineries will also be open for tasting! should be busy and fun! Art in the Garden was a success even in the sprinkles! A beautiful setting!